Business Card Size & Shape – Does it Matter? What is the best business card size and shape? Making your business card size larger or smaller may make it different from all the others in the pile but actually does it really help? Or does it get lost more quickly and just annoy so that it ends up in the bin sooner rather than later? The standard business card size for a UK business card is 55 x 85mm. Printers who print large quantities of business cards will print them all together, ‘ganging’ them up. This keeps the cost down but means they only print a standard size so the cards are trimmed all together. The cheaper ‘freebie’ cards obtained on-line are much smaller and are conspicuous as such. Making your business card size larger than the standard business card size causes storage problems especially if using a business card file. Smaller cards in my opinion get lost immediately at the bottom of my bag. 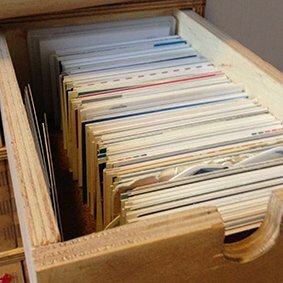 The larger variety of business cards get folded to fit in with all the others, at which point you could supply a postcard and get more space for any relevant information. 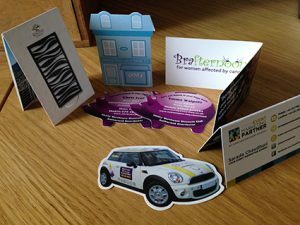 Unusual shaped business cards can be attractive and a talking point! Always a good opening to a conversation when something original is handed round. The Utility Warehouse business cards were ‘pig’ shaped – and mass produced, now they have a ‘Mini’. Everyone in the business can have a pig or mini shaped card and they have become quite distinctive! 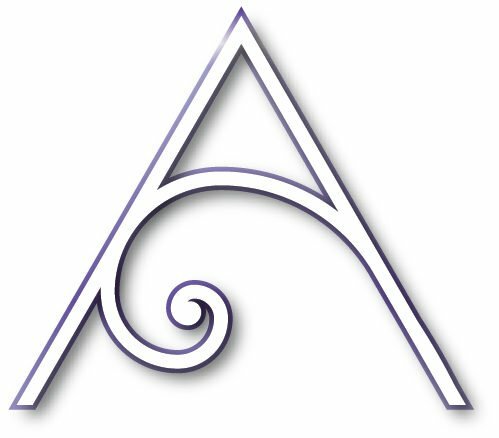 The cost of producing a business card in these shapes is expensive for a one off but when shared between so many representatives the cost is minimal. Anything that is not ‘standard’ costs more. A shaped business card has to be cut out rather than just be trimmed after printing. A ‘die’ or ‘die cutter’ is made and then the business cards are stamped out individually from the sheet which is a longer finishing process. It’s not hard but has to be done properly as the die must be accurately placed matched up with the design. Good artwork files are essential. Adding a shape to your business cards will add at least £100 to the cost – this may overstretch you budget. For the extra cost you could produce a supporting leaflet or post card that may meet your marketing needs and function more effectively. A good quality and well designed card will most likely serve your purposes far better than one that is so expensive to reprint you hold on to them so tightly you never give them out!